Footprints in the Sand, professionally designed and decorated with new furnishings, new floors, new fireplace surround etc. Footprints has sweeping ocean/beach and wildlife views from every room and only a minute walk to one of the best beach access on the Island! We're also pleased to announce that we were chosen by VRBO to become a part of their Premier Partners Program! I designed and built our home and tried to include all the features in "Footprints" that I thought were missing when we were renters. 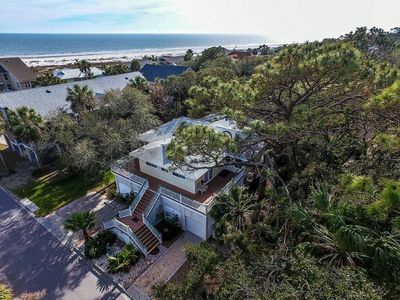 This spacious showcase home sits across from the Atlantic Ocean at Fripp Island, named in Southern Living Magazine's top 10 picks for the "Most Amazing Island Getaway in the U.S."! All you have to pack is your personal items....we provide the rest. 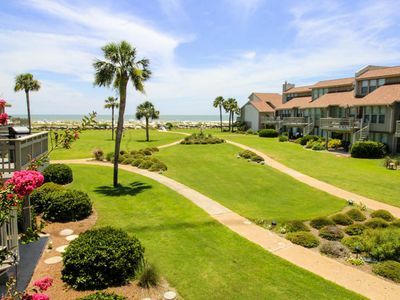 Your weekly rental includes a free golf cart, bikes for all ages, beach chairs, beach towels, beach tote, upgraded linens and toiletries like a hotel. Up to four amenity cards are also included with your weekly rental. 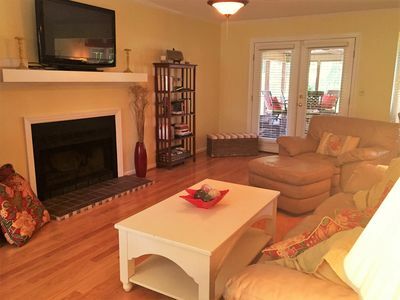 We've totally renovated our home with new floors, new fireplace surround, upgraded flat screen tv with new family room pieces, new mattresses, pillows along with other new furnishings throughout the house! 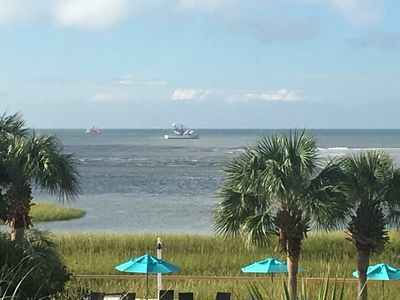 Our beloved author, Pat Conroy’s wife/author, Cassandra King, and her 'Same Sweet Girls' group have stayed in our home several times and loved it! 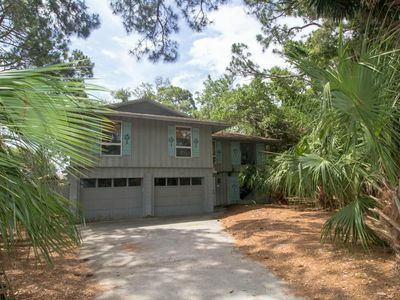 - Across the street from the ocean with 1-2 minute walk...easy access to the best part of the beach with beach all day long! We're at one of the nicest beach accesses on the Island...beach access #1 with a new walkway perfect for strollers. You don't have to walk thru dunes or on a boardwalk...just step onto the beach! 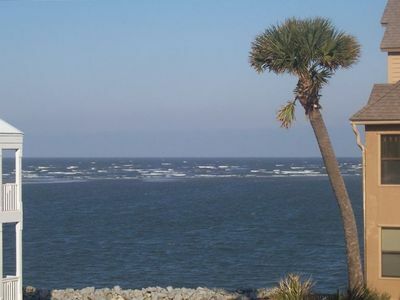 Don't be fooled by very crowded 'center island' or Tarpon locations,with no room to spread out...our beach access provides privacy with 24/7 beach! 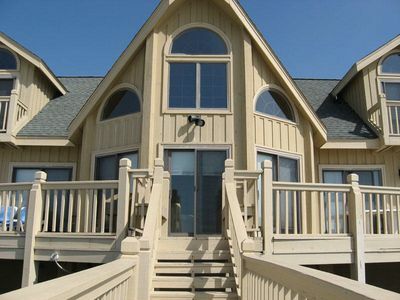 - Balconies off all bedrooms with huge decks on front and back of house. Every bdrm has an ocean view and it's own bath. Enjoy sunrise, sunsets or just sun bathing! hypo- allergenic pillows,flat screen t.v. and seamless tile shower for total luxurious comfort! The home has also been upgraded with hotel quality linens & towels. - First floor offers an inviting open plan perfect for family gatherings...with kitchen overlooking dining room and family room. 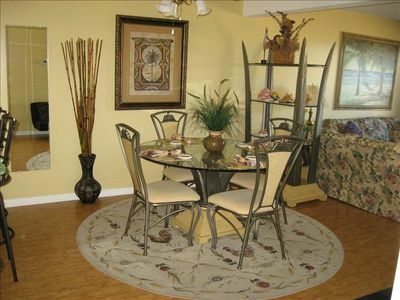 Dining area opens onto back deck overlooking the golf course! 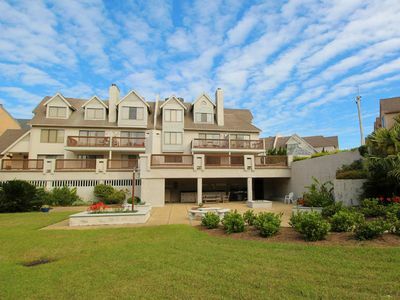 Master is on the main floor, is handicap accessible and boasts an expansive bath with ocean views. 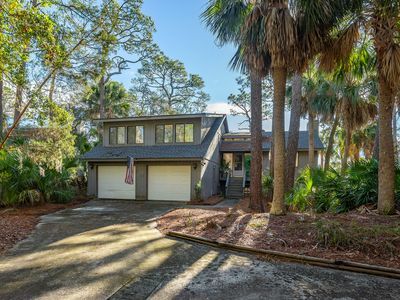 - Family room equipped with 56" flat screen tv, has 20'ceilings with enormous 2-story bay windows that look out to the 5-star 'Ocean Point' golf course, lagoon and amazing wildlife! 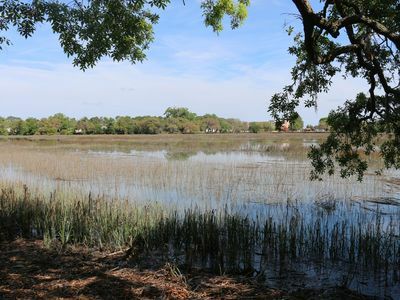 Footprints also sits next to a private lot that has become a bird sanctuary, perfect for you bird watchers. - No matter where you are on the first floor, you can be a part of the conversation while enjoying the ocean breeze and smelling the Island's scent! - Lots of places to retreat for quiet moments and the kids can enjoy our Game Room equipped with a foosball table, T.V./DVD with hook ups for Play Station, X-box etc and a huge chalk board wall for the little ones to draw their masterpieces! - Create amazing meals while smelling and hearing the ocean through the large windows in the kitchen. Kitchen is well-equipped with stainless double ovens, lots of counter space and a new stainless french door refrigerator and extra mini refrig for added grocery storage! 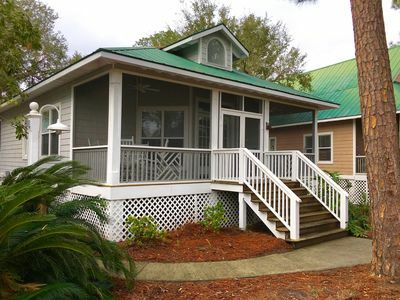 - Enjoy meals cooked on the commercial grill and served outdoors on the large glass table (seats 6-8 in addition to another table that seats four) while overlooking the 8th fairway and wildlife! 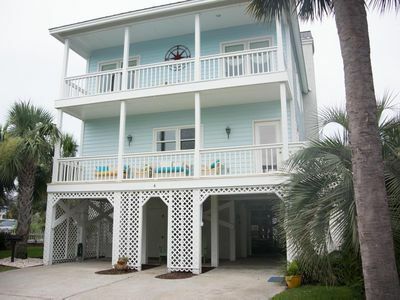 - Upstairs has four comfy bedrooms, each with a uniquely appointed beach decor! 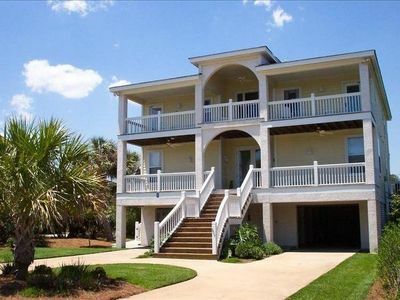 - Two bedrooms face the ocean each with Queen beds and jack and jill baths. One of the Queen bedrooms has an additional twin bed. 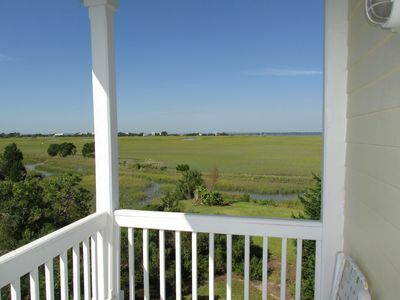 Both rooms open to the upper front deck looking onto the Atlantic Ocean where you can also enjoy the sunrise! A queen high quality air mattress and pack n' play are available as well. 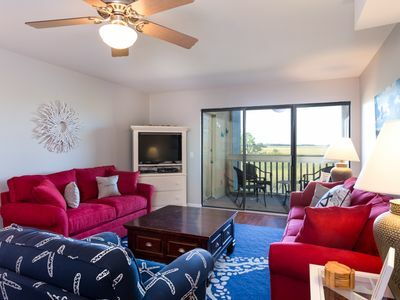 - The other two bedrooms view the golf course and have two twins in each room along w/ jack and jill baths and private balconies to admire the ocean and sunsets as well! We manage our home like an upscale hotel, furnishing all the baths with toiletries, hotel quality towels & linens for total pampering! Our property manager lives nearby to ensure everything runs smoothly during your vacation. 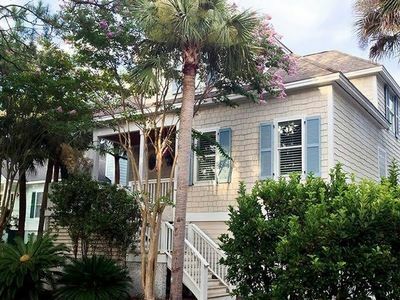 'Footprints in the Sand' is a pristine home that is exceptionally decorated with a cozy beach flair and has been included in Fripp Island Resort’s 'Tour of Homes'. Handicap-friendly with secured WiFi, The yard is perfect for croquet, badminton or volley ball and the kids love to roller blade and ride bikes in our circular driveway too! One of our recent guests even had her bridal reception in the backyard overlooking the golf course and the sunset! Come and enjoy this unbelievable vacation home!! Home can be rented Sat-Sat or Sun-Sun except during Summer Season when rental is Sat-Sat. In addition to the free golf cart and bikes, rental also includes beach chairs, beach towels, beach tote, Pack N'Play, twin air mattress! 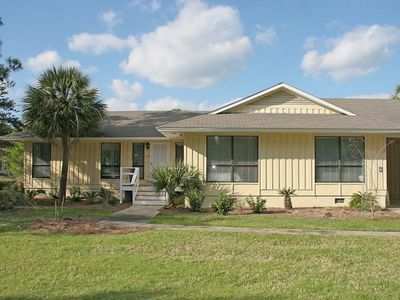 Pristine & Peaceful Golf/Beach Cottage Waiting for You! OCEAN Point-2017 RENOVATION! Designer decorated. Steps to pool and OP golf ! 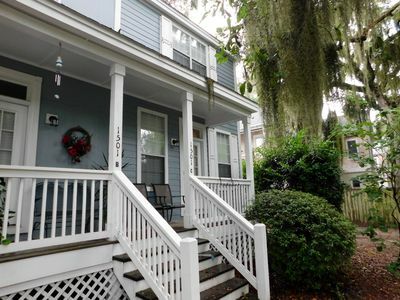 Charming Port Royal Townhouse Just A Stone's Throw To Parris Island! 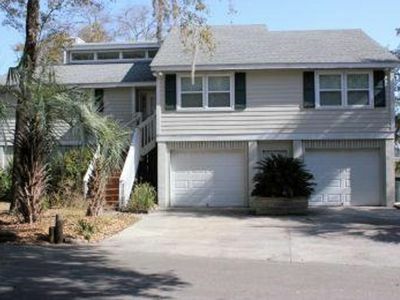 Beach Club Villa/Centrally Located/Marsh & Canal Views Please ask us about Golf Packages for Monthly Rentals!!!! 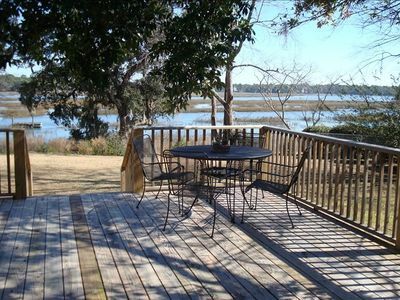 Amazing Water Views, Professionally Decorated, and Tons of Space!